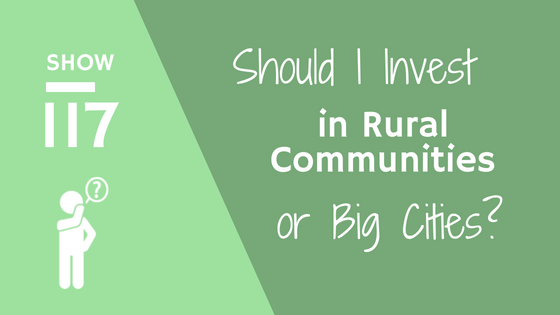 Should I be investing in rural communities or big cities? Show117: Should I invest in rural communities or big cities? I LOVE this question. Call me crazy but this question brings to light one of the things I get most excited about when it comes to investing in rentals....knowing your markets. While there are so many of you out there who wonder this question and think about specifically when you hit the roadblock of not being able to afford to buy in your area. I hear this from people in San Francisco, NYC and even the DC area. True story...this exact problem happened to us when we bought our first rental. ....we started looking in neighboring towns and communites. ...it's a bit deeper than a simple black and white answer. In the show we talk about the things that you should be considering and weighing in your decision of where you should invest. Most importantly, it all comes back to numbers. I have read your blog and this really helps me! thank you for sharing such an amazing blog. Thanks for the kind words. Great to hear it is helping!